Modernist artist Margo Lewers stored materials for possible use in future artworks within her beloved garden. The storage space, primarily untouched for nearly four decades, marks the working life of an artist. The team at Penrith Regional Gallery & The Lewers Bequest recently embarked on a Collection Internship which involved retrieving artefacts, uncovering and recording the items Margo stored in her shed. 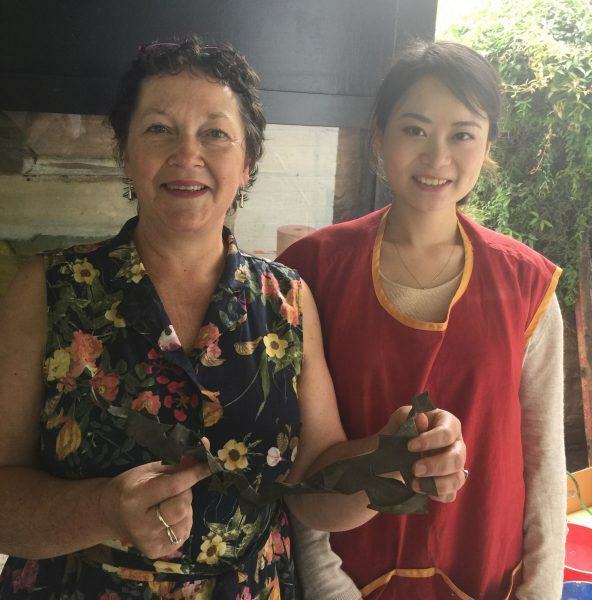 Student intern, Defei Feng, currently studying the Master of Art Curating at the University of Sydney, joined Collection Manager Shirley Daborn on this intriguing archaeological art project. We had no idea what we might discover in Margo’s storage shed, so it was very exciting to find the maquette for a section of the Reserve Bank of Australia Four Pieces sculpture. The sculpture was initially designed by Gerald Lewers for a commission he won in 1962. Unfortunately, Gerald died in a horse riding accident and was unable to create the work. To Margo’s credit she was able to realise Gerald’s vision in the same year that he died and, after constructing a full-scale model on the gallery site at Emu Plains, the sculpture was created and installed in the Reserve Bank in Canberra in 1964. The relief sculpture measures approximately 216 x 480 cm.